The 17th Century was the beginning of importation of Africans to America. From the beginning of their arrival, they have contributed to America history. They fought in every war. When they became eligible to vote, they supported a presidential candidate that addressed issues affecting their needs. World War I (WWI) was one of those wars that African Americans were required to register for the Draft. Alexandria, Virginia African Americans registered in large numbers. Many of them served in WWI and they left military records about their lives. Those records became important source of information for the descendants of World War I veterans. The United States (US) entered WWI in 1917. The war had been going on for about 2½ years prior to the time the US entered. President Woodrow Wilson stayed neutral for the first two years of the war; but a decision by Germany changed the position of the United States. Germany in early 1917 decided to have a submarine warfare on all commercial ships going to Britain. US sent ships to Britain; German submarines attacked those ships. On April 6, 1917, the US declared war on the German Empire. WWI provided many opportunities for African Americans; one was to fight for their country, another to travel and to migrate from southern cities to seek work in northern factories, and lastly to explore new careers. What WWI did not provide was the abolishment of “Jim Crow” laws and equality for African Americans, and that did not come until after World War II. Alexandria African Americans like other African Americans in the United States registered for the draft. I will be posting blogs on the Alexandria African Americans draft registration by alphabet. Displayed below are the African American Alexandrians with the “A” surnames. 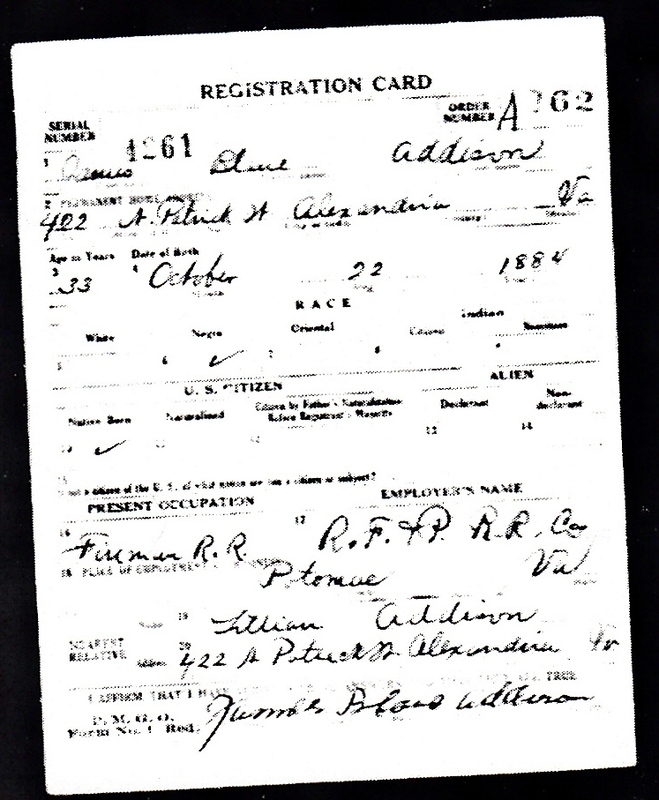 This entry was posted in Uncategorized and tagged Alexandria Black Military, WWI Draft Registration Card. Bookmark the permalink.